Over the years, we've found a lot of old mines in our travels around the state, so much so that they barely seem worthy of mention anymore. Iron, zinc and copper, especially in the northwestern portion of the state, were fairly commonly found and mined extensively until cheaper sources were found in the Midwest. But uranium? That was a new one on me. Ivan and I were departing Bulls Island after a warbler-finding excursion the other day when he spied a sign on the opposite side of Route 29 from the park entrance. "Uranium ore," it said. "Found here in 1956 near Raven Rock. Mining company formed by prospectors responding to the cold war craze was never commercially viable." 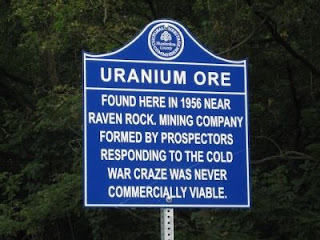 We've come to expect that two sentences on a Hunterdon County historical marker will lead to a much more involved story (see Liver Eating Johnson), and it appears that the uranium mention follows suit. According to a 1956 United Press story, brothers Alvin and Vernon Gatling claimed to have found a rich supply of the mineral element near Route 29, stating that samples from their 400 acre claim contained at least 2 percent and as high as 7 percent raw uranium. Their lawyer, a former federal prosecutor, said that the brothers were licensed by the U.S. Atomic Energy Commission, which had confirmed the uranium content. So... if that's the case, what happened to the mine? Why is the historical marker the only sign of anything to do with uranium? Had locals protested the inevitable scarring of the beautiful landscape? Did the brothers dissolve their business after a dispute? And why, when I checked all my usual sources, could I find no mention of uranium mining in New Jersey, the Gatling brothers, or, for the most part, Raven Rock? I had to do a bit of digging to get the answer, and it turns out that timing worked in my favor. Local historian Bill Saja tells the story in the recently published anthology Stories from Raven Rock New Jersey. Actually, the first sign I found that something was off was the description of the Gatlings in the newspaper story, in which Vernon claimed they were "graduates of the New York Public Library school of geology" and had spent six months working in Colorado uranium mines. I'm obviously a big fan of personal study, but when radioactive elements are concerned, I'll stick with the traditionally trained scientists, thank you. Saja's account led more credence to the gut feeling that things were not completely legit with the Gatlings. They were college educated --Vernon a law student and Alvin having two years undergraduate study -- but not in the sciences. Rather, they seemed to want to cash in on the uranium craze that had hit the U.S. with the advent of nuclear fission as a clean, viable power source. It all started when the brothers stopped by the old Raven Rock stone quarry and asked its owner, Anton Schuck, if they could check it out with their Geiger counter. Figuring they were just harmlessly exploring as so many other hobbyists were at the time, he gave them permission to go on the property. When they came back a few months later to ask if they could do some test borings, he allowed them in again. He even let them use his garage to store the results, which they said indicated the property held little uranium. Thing was, they weren't entirely truthful with Schuck, which he discovered when they returned to the quarry and began drilling an access shaft without his permission. The brothers had been busy during the intervening weeks, filing a lease for the property at the Hunterdon County courthouse. Despite the fact they hadn't gotten Schuck's signature or permission to use the land, they felt they had standing, based, probably, on their find. While Schuck fought to get the aspiring miners off his property, Raven Rock and its environs became the center of attention for the media and curiosity seekers. The aspiring tycoons were busy selling stock in the Gatling Brothers Mining and Development Company, based on the growing estimation of the value of the uranium they'd extract. Some of their contractors and attorneys agreed to take payment in the form of equity; family and friends were eager to buy in at 25 cents per share. Apparently the brothers themselves were as taken in by their dreams as their other investors were, spending their anticipated riches before seeing any marketable product from the mine. Inevitably, the entire situation ended up in the courts for a variety of reasons, the Gatlings' claim on Schuck's land being just one. With limited funds and no income from the mine, the brothers simply couldn't pay their bills, leading to accusations they were intentionally writing bad checks. The federal Securities and Exchange Commission was investigating them for improperly issuing stock to investors. And several lawyers refused to represent them, claiming that the brothers wouldn't listen to sound counsel. Meanwhile, the mine site lay fallow, nature taking back what man had disturbed. The whole thing was finished for good in 1963, after the Gatlings filed a suit against Schuck for damages and mineral rights. As a compromise, the brothers agreed to secure an expert who could confirm the presence of valuable uranium on the land, but they never followed through. In his judgement to dismiss the case with prejudice against the brothers, the presiding judge said, "this matter has been adjourned six times, four times at the request of counsel of the plaintiffs, and two times when counsel for the plaintiffs did not appear." I'd say the courts saw the whole thing as a nuisance instigated by two very misguided men. It's that lack of sense that makes it all so puzzling. The brothers clearly weren't con men: they ended up just as damaged as the people who'd invested time and treasure in their scheme. Saja raises a possible clue in his account: less than a month before the brothers filed incorporation papers for their mining venture, Alvin had been released from a six-week stay at Marlboro State Psychiatric Hospital. Whether Alvin's mental state played a role in their poor business decisions or not is up for conjecture. From what I can gather, they'd formed an enterprise in search of a mine, and the Raven Rock quarry appeared as good a place as any. I have stock certificates dating back to 1955 signed by these two brothers if anyone is interested. I have 100 shares in stock certificates from this company dated back to 1955, signed by the two brothers. Very cool! I have original stock certificates signed by these two brothers for their mining company, dated 1955.